Watford Brewers Decorator Centre carries a comprehensive range of wallpapers and paint brands, tools and decorating sundries. Our team has excellent product knowledge and you are always welcome to ask questions on anything from surface preparation to recommended paints for specific purposes. We also have an in-store customer internet terminal for Wallpaper Direct and Designer Paint Click + Collect to store, and we also deliver locally. We have dedicated disabled space in our customer parking area outside. 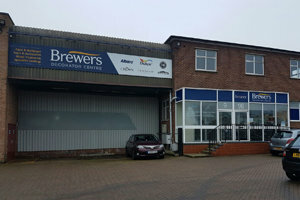 You'll find the showroom on Fisher’s Industrial Estate diagonally opposite the BP garage on the A4178 Wiggenhall Road. Fisher’s has large red signs at the entrance – it’s not the same entrance as the car sales garage directly opposite BP. Wiggenhall Road is near Watford General Hospital and Oxhey Park. Head east on Blackwell Dr towards Deacons Hill/A4178. Turn left onto Wiggenhall Rd/A4178. Fishers Industrial Estate will be on the left. Head north on Wiggenhall Rd/A4178 towards Lammas Rd. Fishers Industrial Estate will be on the left. Head north-east on Cardiff Rd towards Wiggenhall Rd/A4178. Turn right onto Wiggenhall Rd/A4178. Fishers Industrial Estate will be on the right. Head south-west on Eastbury Rd/A4125 towards Oxhey Rd. Turn right onto Deacons Hill/A4178. Continue to follow A4178. Fishers Industrial Estate will be on the left.